Big Sis and I were on the road yesterday heading west from the southeastern coast of Virginia where I live all the way across the state into the northeastern tip of Tennessee in the mountains to my Mom's house. Along the way we stopped in Lynchburg, VA for a nice lunch and a little shopping in the downtown historic district. 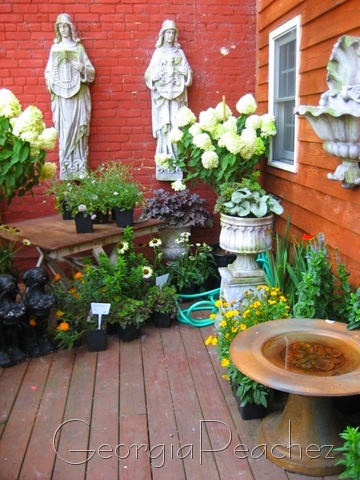 We happened upon a lovely back garden in one of the shops, a french antique dealer. While sis drooled over the vintage french goodies inside I stepped out onto the back patio. Next we stumbled upon an old style hardware store that had 3 floors of architectural salvage. 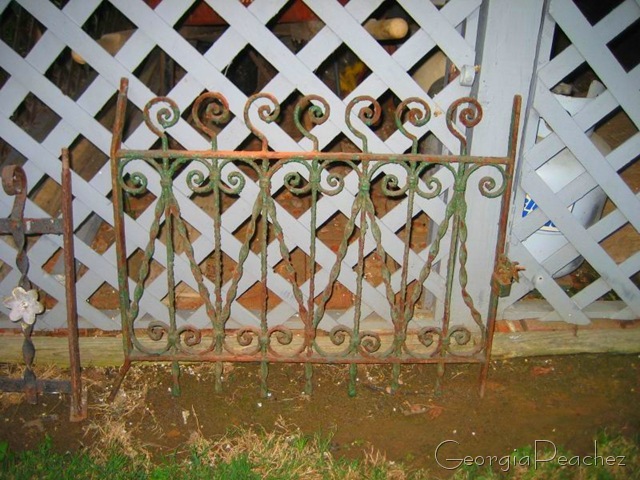 We were immediately drawn to the old chippy iron railing remnants. Sis picked out a couple to gift to mom and I picked out one for my garden at home. 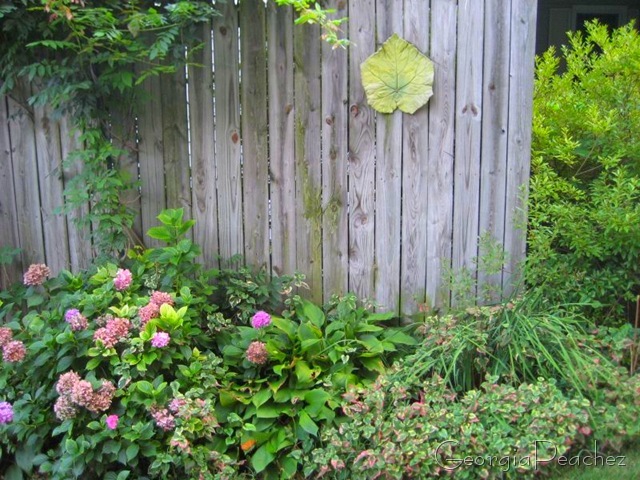 Here is a picture from Mom's garden just for fun. Tomorrow is the Tree Streets Yard Sales, oh yeah. You girls are having a hoot, aren’t you? I wish I knew my sisters now! Oh Suzy, I announced a “where bloggers create” tour I’m hosting a week from tomorrow today on my blog (Saturday). Hope you can participate. I love seeing your “creative” rooms! 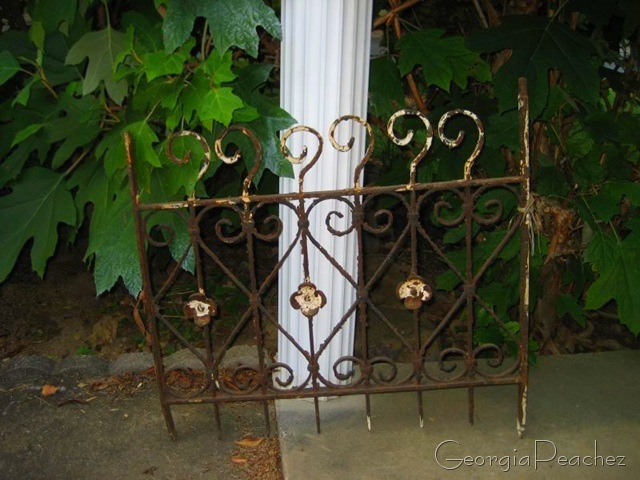 The iron railing remnants are charming; I’m sure your mother appreciated her gift! 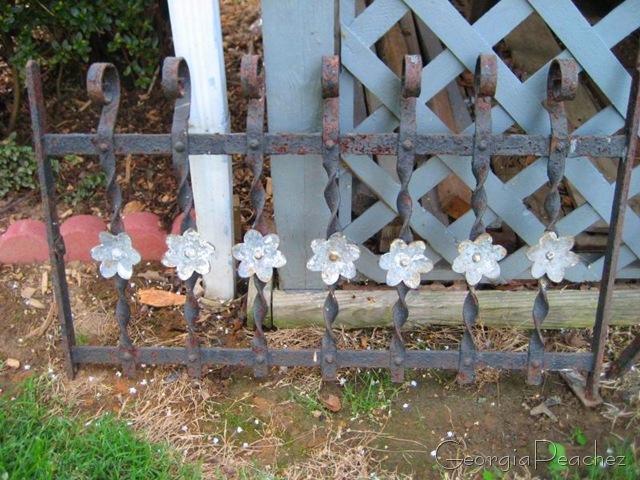 I would drive all the way to Virginia just for that railing with the pretty posies on it.